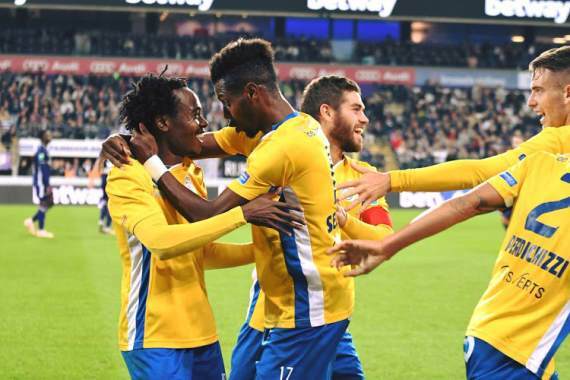 Former Mamelodi Sundowns star and current Union Saint-Gilloise forward Percy Tau scored a brace on Thursday as his side reached the Belgian Cup quarter-finals for the first time in 50 years. Saint-Gilloise were taking on lower tier outfit Knokke in a last-16 tie and took the lead as early as the 10th minute in the contest. However, the minnows struck back just before the break to ensure it was all square at half-time. Yet, in the second stanza Tau came to life and put his team ahead in the 59th minute. The in-form Bafana Bafana striker - who is in the running for the 2018 CAF Player of the Year award - then completed his brace 10 minutes later. Nonetheless, there was a nervy finish to the game for his club as a red card to teammate Marcel Mehlem meant Saint-Gilloise were starting to get pinned back in their own half. Knokke did pull a goal back however Les Unionistes managed to hang on as they advanced to the quarter-finals of the Belgian Cup. The last time the side did so was a half a century ago. The result means the Luka Elsner-coached outfit next face giants Racing Genk in the last eight on 18 December.